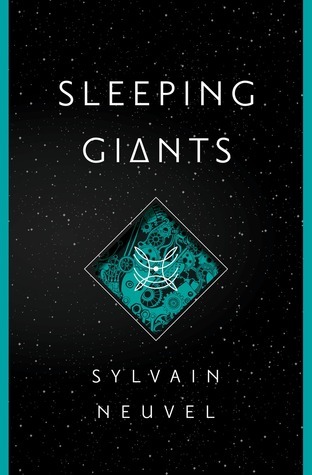 Since spring, I had been hearing rave reviews about Sleeping Giants by Sylvain Neuvel, so I got it for my husband for Father’s Day. He loved it, too! I finally got a chance to read this wholly unique, compelling novel for myself and can’t wait for book 2 of this new series called The Themis Files. In the prologue, an 11-year old girl in South Dakota is out riding the new bike she got for her birthday. She leaves her bicycle on the side of the road for a moment to investigate a sound in the woods and falls into a huge hole in the ground. When rescuers find her, she is at the bottom of a big rectangular pit, lying in the palm of a giant metal hand, unlike anything anyone has ever seen before. Along the sides of the rectangular hole are huge panels, covered in strange symbols. All of it – the hand and the panels – are glowing with a brilliant turquoise light. Then the novel opens 17 years later, when that little girl is now a woman named Dr. Rose Franklin, a professor with a PhD in Physics at the University of Chicago. By a strange twist of fate, she has been put in charge of a joint program between the university and NSA to study the hand and figure out what it is, what it can do, and how it got into a hole in South Dakota. The military didn’t make any progress with the hand years ago, and now she has been given a small team to study it. Other members of her team include Kara Resnick, a skilled but sometimes abrasive Army helicopter pilot whose helicopter mysteriously stopped in mid-air and crashed while flying over Turkey. The project also includes Kara’s co-pilot from that same mission, Ryan Mitchell. Rounding out the team is Vincent Couture, a scientist from French Canada who is brilliant with computers. Unlike the military team 17 years earlier, this team begins to make headway. I won’t say much more about the plot because this is one of those books whose secrets are gradually and deliciously revealed, bit by bit, as you read, so that you can hardly bear to set it down. The whole story is told in an epistolary style, with each chapter representing the transcript from an interview, an experiment log, a journal entry, or other type of document in the case file. Part of the mystery of the book is that it is filled with interview transcripts of all the main players on the team, but we don’t know whom the mysterious interviewer is. All the rave reviews I heard about this novel are true…and more. The action starts fast and continues to build momentum with every page. The more the team learns, the more it is clear that this thing they are investigating is almost certainly a game-changer, something so high-tech that nothing like it has ever been seen – or dreamt of – before. Besides action and suspense, this novel is also thought-provoking and asks the big questions: about the price of scientific development, the balancing of the needs of the many over the sacrifices of a few, and what is to be the fate of humanity. This hand is clearly non-human made, and the deeper the team digs into its origins and use, the more the moral and ethical questions pile up. It is an engrossing story that will pull you deep into its depths. Just when you think you understand what’s going on, the book ends with a twist that leaves you dying to read the next book in the series. I can’t wait to see what Sylvain Neuvel dreams up next in book 2! Book 2, Waking Gods, is due for release April 4, 2017. P.S. Movie rights to Sleeping Giants have been purchased (yay! ), but nothing concrete is in the works yet. NOTE: If you have not yet read the first book, don't read the description of book 2 - spoilers! It certainly seems like a great recommendation though! It's Monday 10/31! What Are You Reading? It's Monday 10/24! What Are You Reading? 2016 Big Book Summer Giveaway! It's Monday 10/17! What Are You Reading? It's Monday 10/10! What Are You Reading? It's Monday 10/3! What Are You Reading?